Are the Stock Exchanges Really Gouging Traders? (Bloomberg Opinion) -- Brad Katsuyama, the hero of Michael Lewis’s high-frequency trading book “Flash Boys,” understands the stock market as well as anyone on Wall Street. He’s tossing around numbers, though, that aren’t helping his cause. On Tuesday, Katsuyama’s IEX Group Inc. released data showing that Nasdaq Inc. and the New York Stock Exchange charge as much as 1,800 percent more for stock market information than it costs IEX to provide what it says would be a similar product. IEX also said its rival exchanges inflate connectivity fees by as much as 4,200 percent. IEX released the study with as much fanfare as it could muster. Katsuyama wrote an open letter on LinkedIn and submitted a 39-page research report to the Securities and Exchange Commission. He also appeared on Bloomberg TV. The study plays into a growing debate about whether the two main exchanges, IEX’s rivals, are abusing their position in what is essentially a regulatory-assisted oligopoly. 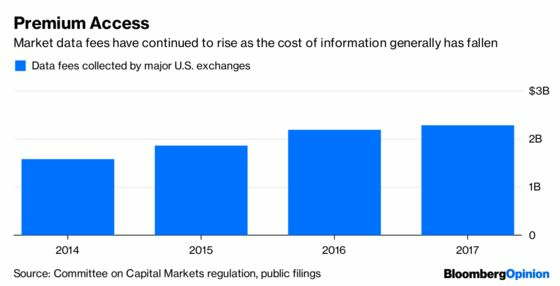 It will curry favor with the large banks and IEX’s potential customers, which have been arguing for a while that the exchanges price-gouge when it comes to data fees. They say that raises the costs of trading for everyone, from hedge funds all the way down to mom-and-pop investors. The fact that IEX, too, has to pay those data fees is notable. The cost of data is among a number of market issues that the SEC seems to be, for the first time in a while, genuinely investigating, which I have argued is exactly what it should be doing. IEX’s study as an exercise in public relations and trolling of the big exchanges is excellent. As a well-reasoned argument that should move the market structure debate forward, though, it’s a failure. The essence of IEX’s argument is that Nasdaq and NYSE are abusing their power as market leaders because they charge way more for market data and connectivity than it costs them to provide that service. But why should cost be the controlling factor? Why not supply and demand? Even IEX doesn’t charge its customers what it costs it to provide market data. It charges nothing, because as an exchange with minuscule market share, as NYSE never forgets to gleefully point out, that’s about what IEX’s trading data is worth. If the SEC is going to require that Nasdaq and NYSE lower their data prices based on cost, then they are also going to have force the IEX to raise its prices. The actual cost of providing data for Nasdaq and NYSE may be small. Lots of other things the NYSE does, like price IPOs and regulate its market, do cost a lot of money. That’s what people who trade on the main exchanges are paying for. And while IEX doesn’t charge specifically for data, it charges an overall bundled fee for trading on its market. And NYSE argues, correctly, that what regulators should be looking at is not individual services but the overall cost of trading, which NYSE says is about a third lower per trade on its exchange than on IEX. Katsuyama is correct that the price that Nasdaq and NYSE charge for data and connectivity is not being controlled by the normal market forces of supply and demand. Instead, it’s being set by their duopoly and perhaps faulty regulation. Brokers are required to complete trades at the best price, and the only way to know that is to find out from the exchanges. That requires every broker to buy the large exchanges’ data and creates an artificially high demand in a market that essentially has two suppliers. It’s disingenuous for Nasdaq and NYSE to argue, as they do, that they should be able to charge whatever they can, just like any other company. IEX’s outrage that the price is so much more than the cost is equally disingenuous. The SEC should determine what the fair price for data is or come up with a system that injects fairness into the market. Waving around cost data, though, is just a distraction.